Opening Feb. 16, 2013 – 6-8pm. Free. 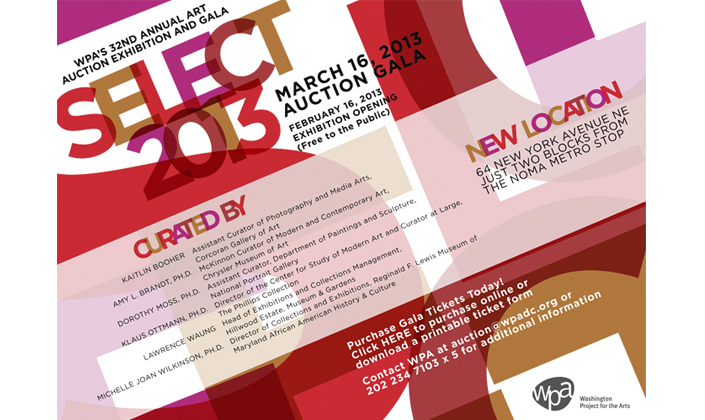 Washington Project for the Arts (WPA) is bringing SELECT, their annual art auction and benefit gala, to 64 New York Avenue, NE, in NoMa, along with a month of programming! The event showcases more than 100 prominent and emerging artists in a month-long exhibition and brings together over 500 patrons and artists for a vibrant gala evening and auction. The exhibition opens on Saturday, February 16 from 6-8 p.m. with a reception for all of the artists and wine and appetizers from Peacock Café. The event is free and open to the public. The exhibition will remain on view from 12 p.m.- 6 p.m. every Wednesday through Saturday from February 20 through March 15. The gala is March 16. Curator talks will take place February 20 (Kaitlin Booher; Amy Brandt, Ph.D.; Klaus Ottmann, Ph.D.) and February 27 (Dorothy Moss, Ph.D.; Lawrence Waung; Michelle Wilkinson, Ph.D.) at 6:30 p.m.